We are waiting with baited breath the preview of Windows 8 in its tablet edition by two Microsoft executives at the D9 conference in California and the Computex 2011 expo in Taiwan this week. While we are taking the role of spectators, OEM manufacturers and Acer in particular, are sweating at the sight of Microsoft's reference hardware requirements, which Acer's CEO called "very troublesome". CEO J.T. Wang has stopped short of disclosing details what these might be, but said: "They’re really controlling the whole thing, the whole process". Well, Redmond obviously doesn't want their creation to feel underpowered, but if they are directly demanding quad-core, we feel Acer's pain. Joking aside, Microsoft introduced a similar approach for the hardware specs of its Windows Phone 7 chassis. Frankly, this ensured consistent experience with the platform across the board, and, despite that all handsets are powered by a first generation 1GHz Snapdragon, WP7 has one of the most fluid, easy-going minimalistic interfaces out there. Microsoft is most likely trying to replicate this experience in the Windows 8 tablets too, and we are just itching to understand if these reference hardware requirements Acer is talking about are for x86, or ARM-based chipsets. NVIDIA Tegra 2 was the silicon of choice for the initial demos, but we should know for sure pretty soon, since both conferences will be in full motion today and in the next few days. It seems like Microsoft may be trying to replicate one of apples secrets to success. Apples hardware is all uniform and optimized for the software. By controlling it they've made a user experience that is as fast if not faster than, smoother than, and more enjoyable than their competitors for the most part(of course THERE ARE EXCEPTIONS, this isn't the rule just the case) with hardware that is seemingly underpowered. Just like how the iPhone 4 remains as snappy as a dual core phone, or how a MacBook with a 2ghz dual core processor is smoother than a windows 7 PC with 2.5 GHz quad core processor, windows phones have been able to be as smooth and snappy as dual core phones as well with a last Gen processor. I'm actually excited about this. We may start to see some real PC innovation from Microsoft fot the first time in years. Totally agree with you bro!! Apple is only made by Apple, where as Microsoft has many manufacturers in line. You can't compare the two. Microsoft wants to make the experience uniform through out. They did this with WP7 and many handsets comply. Acer was just behind a bit and I'm sure they will catch up later. 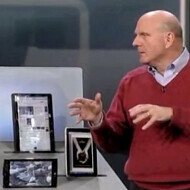 Now what about a W8 tablet by Nokia anyone? You're right. Ms does have several manufacturers while Apple only has one. That's my point chief. MS is trying to make hardware uniform like Apple does. But instead of manufacturing themselves they stick with third parties but require the uniformity built in. You've helped me prove my point. I appreciate it. If you want to play the game, you have to play by the rules in place. Quit whining or go make your own OS and make your own rules. Hmmmmm, before, everyone was attacking Apple about their walled garden approach. Now I see change of hearts, lol. This is not the first time though. Apple was criticized before for using capacitive touch over resistive, not anymore, lol. The iphone was criticized before for its size, not anymore, lol. The iphone was criticized before for focusing so much on apps, not anymore, lol. Apple was made fun of when they were about to release their first ipad, not anymore, lol. Goodness, seems like a lot of Apple haters have eaten their own words. your an idiot. just saying. the difference between apples approach and MS's approach is Apple approaches the product like they are God and you are their slave. You are to do what they want the moment they want it and if anything goes wrong, its your fault (your holding the phone wrong!). MS isnt taking the "walled garden" approach. They are taking the "here's an instruction set for this garden, you must use this and also have the proper tools, but other than that, go play". And that is half way between googles "heres some dirt, go create" approach and apples "its our f#@king garden, your just paying to look at it.. and dont step on anything!!" approach. I'm really really really (did I mention "really") worried MS is going to make desktop Windows 8 a walled garden like iOS, where, as a developer, I'll no longer have the freedom to choose my development tools and write anything I like, anytime I like, sell it anywhere I like at any price I like, anyway I like, and can keep all the fruits of my labor. I have none of that with iOS nor WP7. As a user, I demand my freedom to be able to acquire (legally) any software I like, from anyone I like, for any reason I like. I don't have that with WP7 nor iOS. They have restricted entire classes od apps (like tethering, for just one example). I'm not a Linux fan... don't really care for it, but I'll switch in a heartbeat the second desktop Windows switches from mostly open to a tyrenical dictatorship, controlling what I can and can't do with my own freaking machine!